Water features prominently at world’s largest Earth sciences conference. The American Geophysical Union fall meeting is the world’s largest gathering of the Earth sciences. Some 24,000 people attended the December 15-19 conference in San Francisco. Click image to enlarge. San Francisco — Here, among the hydrologists, seismologists, and climatologists, and between rows of thousands of research posters, you can find the Earth’s pulse — or at least measurements of it. In charts and graphs, the planet’s temperature, blood pressure, and bone density are portrayed in fine detail as well. 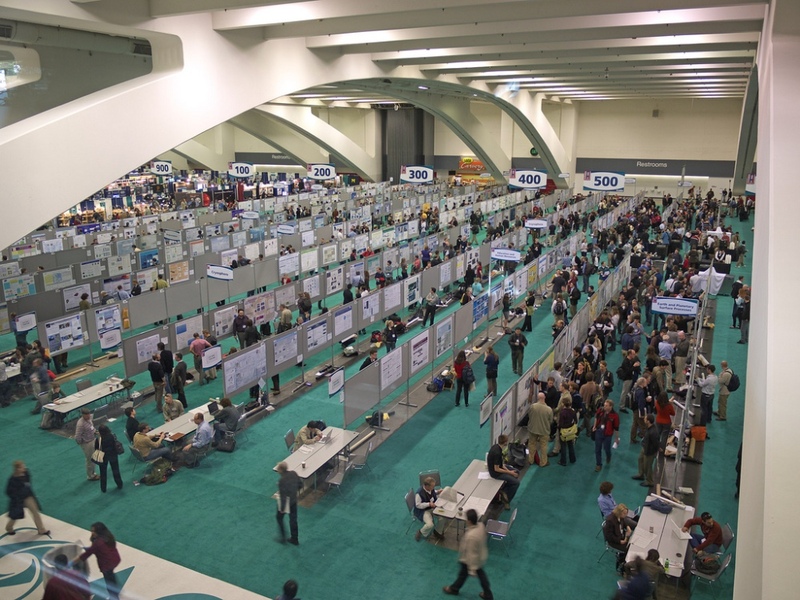 The American Geophysical Union’s fall meeting is the world’s largest convention for the Earth sciences. Every year in mid-December, the Moscone Center in San Francisco’s tech-booming South of Market district welcomes nearly 24,000 of the world’s top scientists for a banquet of research and debate. For five days I sampled widely from the AGU buffet, looking for new insight into the ways in which water shapes ecology and society. Summarizing such a rollicking, capacious science party is an exercise in exclusion. There is simply too much activity for one person to take in. Nonetheless, three important research trends stood out beyond the usual suspects of food, energy, and climate: drought, land subsidence, and the newish sub-field of sociohydrology. Given the meeting’s location, it was not surprising that several sessions were devoted to the historically harsh drought that California has endured for three years. Presenters explored the drought’s implications and causes, as well as ways to make the nation’s most populous state more resilient to future swings of the climate needle toward dry. There is significant interest in understanding the mechanics of California’s precipitation patterns, which are notoriously bipolar — searing droughts dethroned by furious floods. A three-month experiment that begins in January will monitor two processes that play a large role in the state’s moisture cycle. A collaboration between multiple federal agencies and research institutions, the CalWater2 experiment will use aircraft, ships, and land-based instruments to collect data on aerosols and atmospheric rivers. Aerosols — dust, pollution, and other small particles — are the nucleus of a raindrop. Atmospheric rivers are belts of airborne moisture that typically flow from the tropics to the West Coast of the United States. Bearers of playful nicknames (“Pacific Firehose”, “Pineapple Express”), atmospheric rivers nonetheless pack a punch. They can carry as much moisture as 10 to 20 Mississippi Rivers. The five or six atmospheric rivers that might hit California in an average year have an outsize role in determining the state’s water balance. According to Michael Dettinger, a U.S. Geological Survey hydrologist, droughts occur when those few big storms track north or south. If ocean acidification is sometimes called the neglected twin of global warming, land subsidence could be called a silent partner of the world’s groundwater crisis. The problem is attracting new levels of attention today because many of the planet’s largest cities, in self-inflicted tragedy, are sinking. Parts of Jakarta sank more than four meters (13 feet) between 1974 and 2010. So much water was pumped from aquifers beneath the city to supply its population that the land collapsed. Click image to enlarge. Subsidence occurs when so much water is pumped from the ground that the soil crumples like a wrung sponge, the pores within the soil crushed under the weight of the land. Severe but isolated cases of land subsidence connected to groundwater pumping were identified as far back as the 1930s — in California’s Central Valley, where farm irrigation was the culprit, and in Tokyo, where groundwater supplied millions of urbanites. Now, as more and more groundwater is pumped, subsidence affects agricultural regions and cities both small and large, from tiny Cedar Valley in southwest Utah to Jakarta, capital of Indonesia and home to 10 million people. As a result, interest in subsidence research has exploded, said Gilles Erkens, a geologist at Deltares Research Institute. Subsidence causes all manner of ills. For coastal cities, it increases the risk of flooding and magnifies the danger of rising seas. Sinking land and higher tides mean more flooding, Erkens said while presenting research on the sinking megacities of Southeast Asia — Bangkok, Ho Chi Minh City, Jakarta, and Manila. 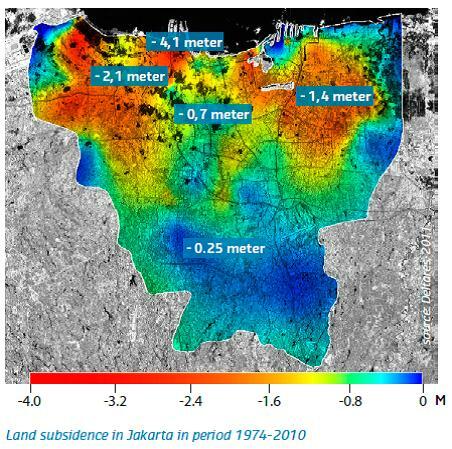 Parts of Jakarta sank four meters (13 feet) in a generation. Buildings and infrastructure are also at risk of damage or destruction. Researchers from Capital Normal University in Beijing showed that this is the case for the high-speed rail line between Beijing and Tianjin, a busy seaport. The trains, which reach speeds of 330 kilometers (205 miles) per hour, travel through a zone southeast of the capital that sank one meter (three feet) between 1995 and 2012. Such instability puts undesirable stress on the rail line’s metal skeleton. I heard a version of this statement many times at AGU, the sentiment being that you cannot really understand what is happening to the Earth without considering the decisions that people make and their response to environmental changes. The idea is an old one, with its earliest, fullest expression in the United States being George Perkins Marsh’s 1864 classic Man and Nature. But with the splintering of academia into disciplines and the hyper-specialization that followed, modern science is only recently catching up with its catholic forebears. Quite a few panels and posters traveled this line of inquiry. One presentation looked at the relationship between rising temperatures and violence. Urban lore certainly connects the two. The Son of Sam serial killings, for instance, terrified New York City during its legendary 1977 heat wave, and films such as the steamy 1980s noir Body Heat link murderous intent with thermal oppression. But Solomon Hsiang of the University of California, Berkeley, analyzed the data. They analyzed 60 studies of climate and human conflict that varied in scale from the interpersonal to the national, from road rage to civil war. It is a tricky field for attributing cause and effect, but Hsiang found more agreement than not that more heat means more conflict. “Disregarding the potential effect of anthropogenic climate change on human conflict is a dangerously misguided interpretation of the available evidence,” Hsiang concluded. Other researchers are looking closely at how mankind alters the water cycle. The International Association of Hydrological Sciences is calling its next decade of research Panta Rhei, Greek for “everything flows.” One of the more than two dozen working groups associated with the project will study whether mankind’s water use is causing droughts to occur. The convention halls in San Francisco were filled with those sorts of questions — questions that probed how our pavement and our levees are producing new flood risks; how diseases will spread in a warming planet; how our irrigated agriculture is vulnerable to water scarcity and how it changes water chemistry; how water solutions such as small dams to store water worsen the problem they were designed to solve; and how fleets of sensors and satellites and international partnerships can help us better understand the world. It is certainly a full meal to digest. Expect more stories to come.